There is a saying that the most luxurious items you own will probably be those you wear least. While I can see why this may be the case (your black tie, patent shoes and dress studs are unlikely to be cheap) it is depressing. I have always liked a little touch of luxury. But I am at heart a cheap man. So I go to every effort to eschew this rule and buy quality items that I will use frequently. The principle can apply to, for example, a work bag that you use almost every day. To your luggage. To one dark brown belt and probably one dark brown pair of leather oxfords. If you are going to buy a luxurious suit, why not make it a mid-grey flannel one with two pairs of trousers? The jacket will always be useful to wear with odd trousers, even jeans (normal, worsted suit jackets never look right in this regard). And the flannel trousers themselves are the standard for odd, patterned jackets. My latest discovery in this spirit is a reversible Hermes tie. Obviously, an Hermes tie is an aspirational item. But the printed variety never really appealed to me – there’s something about a grown businessman wearing flamingos on his tie that smacks of infantilism rather than elegance. But this one, found in the Sloane Street store, is knitted silk. Most importantly, it is reversible. Twice. The two blades are of identical width, and each has one colour on either side. The brand offers various colour permutations, but the most practical – and the one I ended up buying – is black/grey/light blue/dark blue (a slight variant is shown above). These are surely the four most useful solid ties a man can have. And while you can’t wear a knitted tie on more formal occasions, these are fewer and further between today. I end up wearing this tie once or twice a week, which is a lot considering that I don’t wear a tie every day. It’s satisfying wearing something luxurious so often. As Will on asuitablewardrobe.dynend.com is fond of saying, the real value of an item is its price divided by the number of times it is worn, plus some multiplier for the pleasure it engenders in the wearer. Which makes this Hermes tie, despite being twice the price of any other tie I have ever bought, pretty good value. You can follow the discussion on How to buy luxury: Hermes by entering your email address in the box below. You will then receive an email every time a new comment is added. These will also contain a link to a page where you can stop the alerts, and remove all of your related data from the site. Anyone know where to find this tie online? I googled for it, and also browsed the USA and UK collections on the Hermes website… no luck. Hey guys – I can’t see it online, but they did have a decent selection of them in two London stores I was in recently. Perhaps worth checking in the New York store if either of you are near there? I know Hermes often carries lots of different ranges of ties, but often only has the latest season online. Hello gentleman, i just got myself some Hermes ties. And I can say you two things: First Simon is so right: It was worth it’s price in gold – as I never ever received so much compliments on a tie ever. And I have at least 50 ties. Second, never ever buy a luxury item online. What’s the point? You miss all the luxury treatment you will receive in a store or even flagship store. To add some more: It is great to really hunt down luxury items. If you go to an e.g. Hermés store you will notice that a lot if items you’ve seen on their catalog are out of sale. In fact I’ve been to five Hermés stores in all over Europe to get the tie I wanted to have. And it is now my most precious item. Altough other items were way more expensive but in this case it’s the story connected to it. PS: I opted not for a knitted silk tie but for the linen knitted one. It has a nice pattern almost like the Burlington pattern. 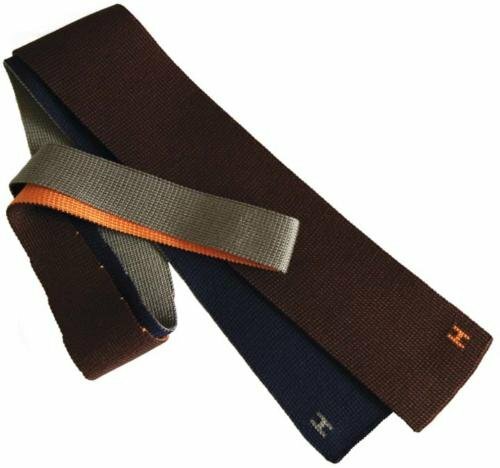 This season Hermes have started doing these ties again in a large range of colour options. Picked up a navy/light blue/deep red/black version and love it. Stupid question perhaps: But I own few of these but having real troubles finding a suitable way to tie it. Any suggestions? ok cool, I’ll try again. thank you for answering!